All 24 participants enjoyed the round-trip LIRR ride to Montauk. Although the weather brought some fog and a little rain, the spirits were high among those in attendance and they were treated to a tour of the lighthouse and a wonderful lunch at Gosman’s Dock. We will leave from Penn Station at 7:45 am and transfer at Jamaica for the 10:46 am Montauk train (board the third car from the rear). We will arrive in Montauk three hours later. A chartered school bus will take us to the lighthouse seven miles away in neighboring Montauk Point. You should be in good health if you plan to climb the 86 spiral steps to the top. 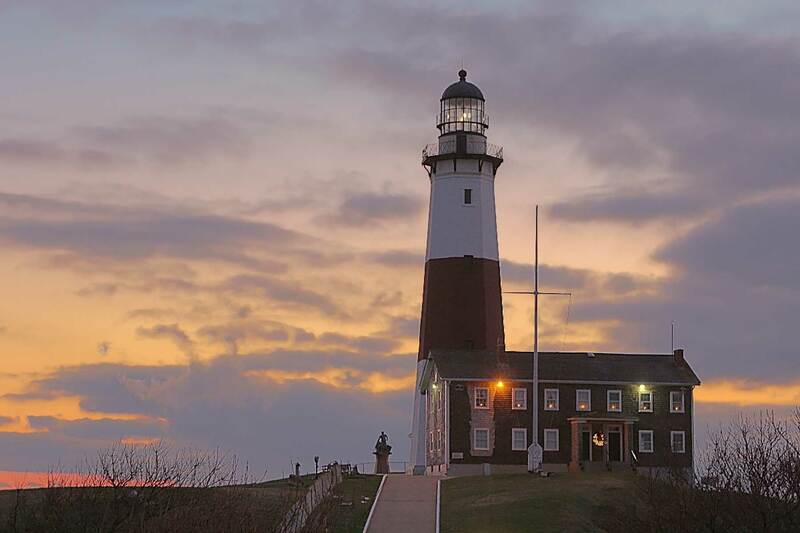 We will arrive at the lighthouse around 11:15 am, spend an hour and a half exploring and taking pictures, then return to Montauk at 1:30 pm for lunch at Gosman’s Dock Restaurant. We will take the 3:30 pm home, arriving at Penn Station in time for dinner and an evening on the town at your expense. The ticket price for the trip is $100. This includes rail and bus transportation, lighthouse admission and lunch. Please write your email address legibly on the order form (PDF download below) so we can notify you if there are any changes in the arrangements detailed above. For further updates and information concerning this trip, please e-mail Steve Kalka at trip@nyrre.org or call him at 516-660-1972. This trip operates rain or shine.